Faceted, AAAA, blue flash, bezel-set, labradorite and sterling silver pendant necklace. This beautifully faceted, flashy, long, labradorite triangle is set in a sterling silver bezel. The gem flashes with rich and vibrant cobalt blue and royal blue hues from several different angles as it catches the light. Different facets light up with color as the pendant moves. One side of the pendant is shown in the first eight photographs, and the other side is shown in the last picture. Like all the labradorite jewelry in my Etsy shop, this is a natural and untreated gemstone. The labradorite triangle measures 31mm x 12mm x 6mm (1 1/4" x 7/16" x 1/4"), not including the ring soldered to the top of the bezel. The bezel-set gem is suspended from a sterling silver ring, and it dangles 37mm (1 1/2") from a sterling silver chain that fastens securely with a sterling silver lobster claw clasp. The necklace is shown with a 17" chain in the photographs. 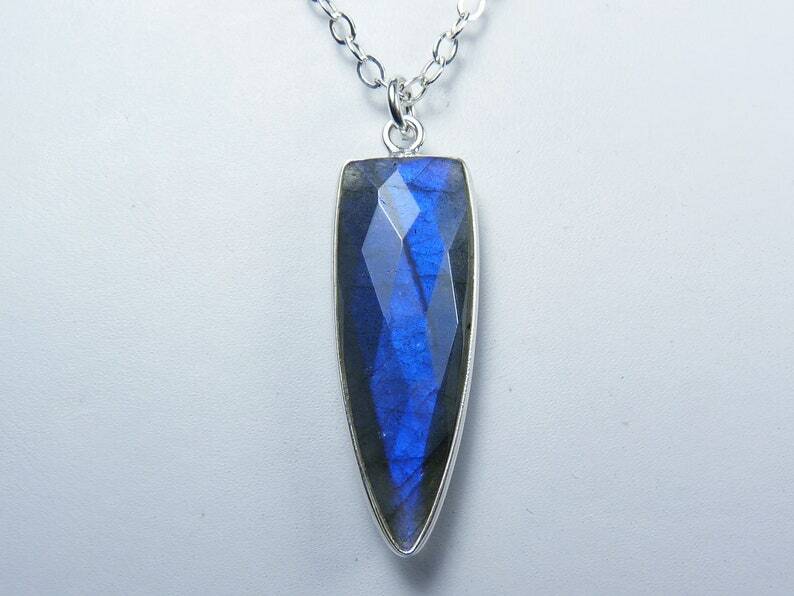 This labradorite pendant necklace flashes with beautiful shades of dark blue!